The origin of the Dachshund has been lost in antiquity and there is much conjecture as to its origin. However, it is generally accepted that the breed came to prominence in Germany where it was used by foresters and noblemen to hunt badger, fox and rabbits in dense forests where a larger animal would have difficulty in pursuing its quarry. The Dachshund is a unique breed in that there are three different coats, Long, Wire and Smooth and two sizes, Standard and Miniature. These varieties were each developed for a specific purpose, mainly depending upon the type of terrain encountered in their district of origin. Today's Dachshund in Australia and England is not normally used for hunting and is only bred as a faithful companion or show dog. This popular little dog usually lives up to 12 years of age, but given a loving home and the correct nutrition Dachshunds will often live up to 14 years of age. Happy and healthy dogs of this breed should be 4.5kg and 15cm in height for the females and 12kg to 20cm tall for the males. The Dachshund is first and foremost a sporting dog, but it is remarkably versatile – being equally adaptable as a house pet. The breed's temperament and acute intelligence makes them the ideal companion for town or country. They have retained a keen hunting instinct that is quickly brought to the surface at the sight of a rabbit or fox. Each variety is different in temperament. The Smooth tends to be more aloof than the other varieties and generally is very discerning in whom it likes or dislikes. 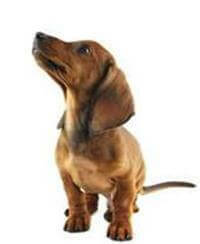 Dachshunds are strong, hardy and easy to care for. All three varieties require marginal attention, with the smooth variety in particular requiring very little grooming. This is obviously a big advantage for the average dog owning family. The long coat is the most glamorous of the three with long feathering on the ears, underline and tail, giving an appearance of elegance for those who prefer a glamorous coated animal. The wire coat is short and harsh to the touch and the breed is characterised by a beard and bushy eyebrows that gives the Wire its characteristic appearance. Dachshunds get bored hanging around the yard and are enthusiastic eaters, so ensure regular exercise or cut down on food. Dachshunds are quite happy to spend their life on your favourite chair, but for the dogs' wellbeing, regular exercise is recommended. Because of their long body in relation to their height, and the fact that most Dachshunds love food, it is important not to overfeed. A dog that is too fat is the most likely candidate for a prolapsed disc, which is the most common problem in Dachshunds and tends to occur between five and seven years. Families. Dachshunds are excellent with children.